Terry Combs offers the ultimate screen printing business course. 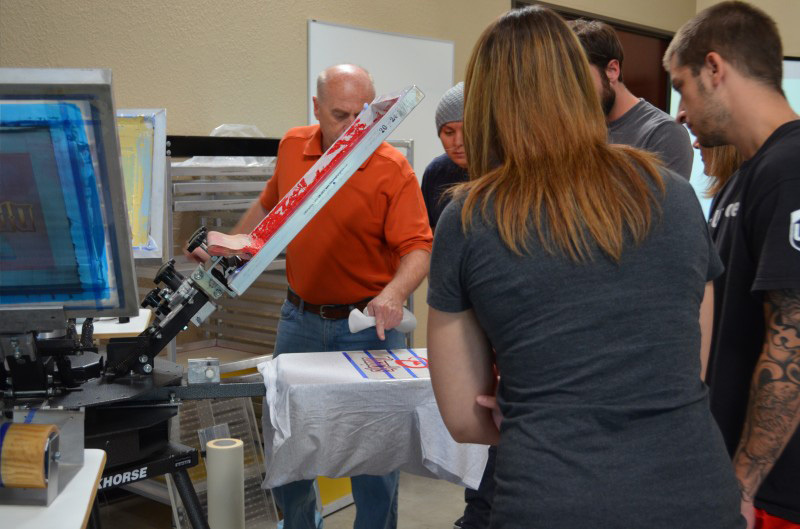 With 30 years experience in the screen printing trenches, printing hundreds of thousands of shirts, training thousands of students, this is the one and only class to offer you the definitive “start a screen printing business” package. Presented in a variety of locations across the U.S., this is absolutely the premiere training event anywhere in the world!!! The Complete Screen Printing Business Course is for anyone who imagines becoming a professional and profitable garment screen printer. Whether working from your two-car garage or from your brand new storefront on Main Street, this class is your complete business startup course. Will there be any classes in february or march. In the phoenix area? I was wondering will there be a class scheduled for May 17-18 2014? Hi Sonny – Due to a date conflict at Workhorse Products, we’re rescheduling this event. Watch for the new date soon! Will you be at any of the industry shows this year? Do you have a schedule? Hi Leslie – Yes, I will be at trade shows this year. Check the Tour Dates tab above for upcoming events. And this is updated as we add new events. Any plans to add a DTG course in the near future? I’ve done some DTG classes on the East Coast, but nothing on the short horizon. Something to seriously consider for the future. Hi Audrey – Yes, we’ll have another class but it has not been scheduled yet. Watch here for the next date. What time are the classes in Phoenix for the classes ? Will there be more classes after April-May. I can’t re-arrange my schedule to get my husband there this next weekend? If you could email me details on the next Phoenix class! Workhorse Products (WorkhorseProducts.com) is the manufacturer of precision screen printing equipment. The facility at 3730 East Southern Avenue, Phoenix, Arizona 85040, is minutes from Phoenix Sky Harbor Airport with hotels nearby. Will there be another Phoenix class soon? I missed the August class. Hi John – Next Phoenix class will be December 10-11. Prior to that, class at Reece Supply in Dallas will be November 19-20. Do you every have Classes in Minnesota? I’m sorry, Molly. Currently I only do classes in Phoenix, Chicago and Nashville. I would like to sign up for the next class – I think it is scheduled for January 27th and 28th 2018. Can you verify that these are the correct dates? Thank you. Hi Amy – Yes, that date is correct and the site has now been updated. Thanks for signing up! What time is the class for booking my flight? Will there be any classes during July or August ? We have a Phoenix Class this weekend, July 21-22. Next class after that is October 27-28. New dates will be up soon, but the 1st class at Workhorse in 2019 will be January 26-27.